Rob Gronkowski is an American Footballer and is tall and has finely tuned muscles. His physical greatness is needed for his professional life as he plays one of the sports that require physical contacts. However, his ripped body is helpful in other ways as well, more so in his love life. Gronkowski's ripped body has helped him to grab the attention of quite a few ladies as well. He may get the attention of girls but that does not mean that he will start a relationship with them since he is already involved in a relationship. So, is Rob Gronkowski married? Find out the details of his relationship present and past. Good news to all the female fans of Rob Gronkowski is that he is not married to date. However, ladies, you should not get too excited as he is currently in a relationship. His current girlfriend is Camille Kostek who is a former cheerleader of his team. Camille Kostek has since then changed her career and now works as a swimsuit model. She recently posed for the 2018 Sports Illustrated Swimsuit edition. Gronkowski and Kostek had made their relationship public back in 2015 and they have been on a wild wild ride in their relationship ever since. Their relationship has not had a smooth sailing as they would hope to. They have been in an on and off kind of relationship. Though Gronkowski's relationship took a short break in 2016, he seems to have gotten back on track with her once again. He is still together with her and despite them having relationship issues every now and then. There is a good chance that Kostek just might be the one to win the rich and successful Gronkowski's heart and make him want to settle down with her. Back in the year 2011, a photo surfaced of Rob Gronkowski together with the pornographic actress and model Bibi Jones. That particular picture caught on like wildfire and caused a storm on the internet. Rumors began to spread that Bibi and Gronkowski were seeing each other. However, that turned out to be nothing more than a rumor as Gronkowski told that the two only took the picture together and nothing much happened. He told that he didn't even get to exchange numbers with Bibi. On her appearance in a radio show, Bibi said that she and Gronkowski never had any sexual relationship and were only friends. 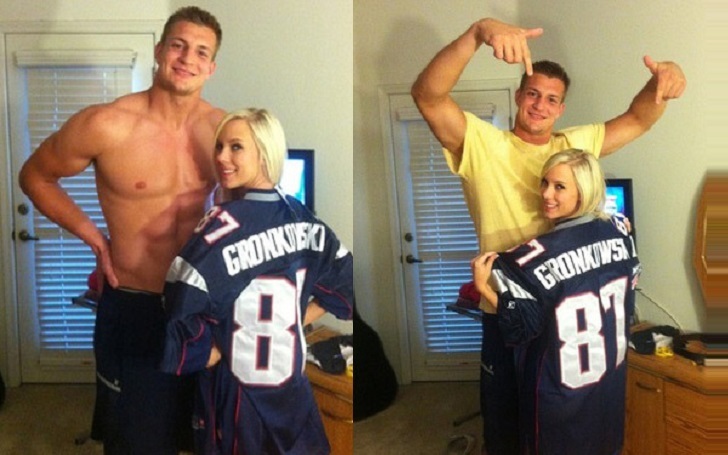 A year later, in 2012, a new picture of Rob Gronkowski and Bibi Jones which was taken on the same night as his previous picture was posted by Bibi on her twitter. This time around, the picture was more revealing. Bibi claimed that someone else had uploaded the picture from her account. No matter how the picture was posted, there was not much response about it and the story of Rob Gronkowski being in a relationship with Bibi came to an end with it.